29 Then God said, 'I give you every seed-bearing plant on the face of the whole earth and every tree that has fruit with seed in it. They will be yours for food. 30 And to all the beasts of the earth and all the birds in the sky and all the creatures that move along the ground—everything that has the breath of life in it—I give every green plant for food.' And it was so. Creation Day 6 - Animals and People Theme Activities begin Here! Materials needed: A variety of skin colored shades of paper, scissors, yarn in a variety of colors and crayons. The children create a self portrait! God made me! The children use their finger and thumb prints to create animals and use colored pencils to embellish with eyes, etc. Show the children pictures from the book The Artist Who Painted the Horse Blue by Eric Carle. Encourage them to create an animal of their own! Add play people and animals to your block area today! Tell the account of Genesis 1:24-31 in your own words and hand motions! Bring ALL your stuffed animals to circle! Have each child choose one. Take turns telling what type of animal they have. 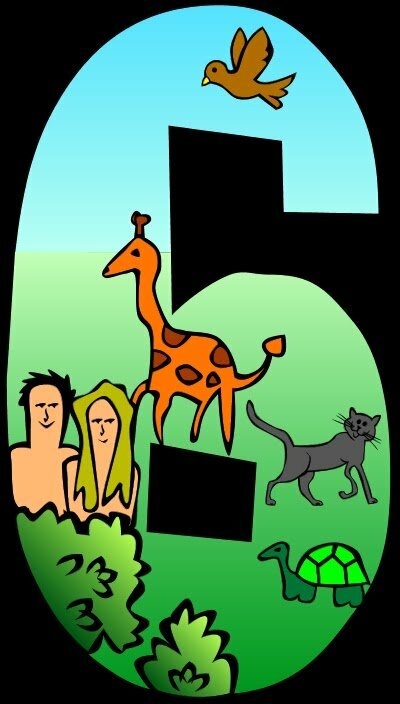 Ask if the animal/fish/bird they are holding is one that what God created on the 6th day or was it a different day? Do you remember?! Bring a few stuffed animals, birds and fish to circle. Talk about them and all that God has created. Ask them to recall what God created on the sixth day (animals and people). What is our job? (To care for God's creation). Show each type of animal. Ask, if this was your pet at home, where would it sleep? What does it need to eat? Find a CD with animal sounds or record your own! Play one at a time and pause, asking children, "Who makes that sound"? Have animal crackers and yogurt dip today! Today, add stuffed animals and play food to your Creation Center. The children take care of all the God has created. Encourage children to paint their favorite animal or to create their own! Encourage children to paint a portrait of a friend in their class. Does he/she have brown hair? Blue eyes, light or dark skin? Freckles? God create each of us uniquely! They act it out and the other children try to guess. VARIATION: Make cards with different animal pictures and their names on the card. A child chooses one card to act out (easier than them coming up with their own sometimes!). I also like this because you can show the children a picture of the card when they are done acting it out. Remember, not every child has seen a giraffe or a hippo! God has made us the same but unique! Play follow the leader...each child has a turn doing a motion that the others copy! We do this in a large circle rather than following a "train" of children. This is a lot for adults to keep up with, certainly frustrating for some preschoolers! Creation Day 6 - Animals and People Theme Activities to help your Preschoolers develop those small muscles in their hands! Animal sorting.....Make bags for land animals, water animals, animals that fly, and people! Cut out and laminate many from magazines for the children to sort! Materials needed: Print out duplicate pictures of each child's face. Laminate. The children use these to match and to name their friends'! Provide pattern blocks and pattern cards of animals and people. Creation Day 6 - Animals and People Theme Music and Movement Activities and Ideas to get your Preschoolers Movin' and Groovin'! This song is from Greg and Steve's CD titled Kids In Motion......you will LOVE this CD!!!!! Animals and people! Animals and people! That was on the sixth day. Creation Day 6 - Animals and People Theme Activities for the Senses! Materials: Sand or soil, little people, animals, birds, plastic fencing (perhaps from a farm toy). Creation Day 6 - Animals and People Theme Science Activities--for your Preschool Scientists in Training! Help children trace their hand on the paper. Help them make a fingerprint on each finger of their traced hand using the corresponding finger! Use magnifying glasses to check out their fingerprints and compare them to a friend's prints! We are all the same but different, by God's wonderful design! Writing Activity Ideas for Your Creation Day 6 - Animals and People Theme! If you don't already have these for your classroom, I HIGHLY recommend making them! You will use them all year! Print each child's first name on the front of a name card. Print their last name on the back. Tape a small (wallet size or smaller) picture on the card. Provide dry erase markers for the children to practice printing their names and their friends' names. Point out that some friends have some of the same letters in their name as you have in yours! EXTENSION: We use these cards for EVERYTHING! If choosing a spot at circle time becomes problematic, we will place name cards on spots and have the children find their name. We will have games where, for our PREK children, we will hold up a name, covering the picture, and ask whose name it is.